In Jacksonville, the project benefitted St. Johns Housing Partnership, an organization that makes housing more affordable for citizens in need by assisting with fixing, renting, buying and/or keeping their home. 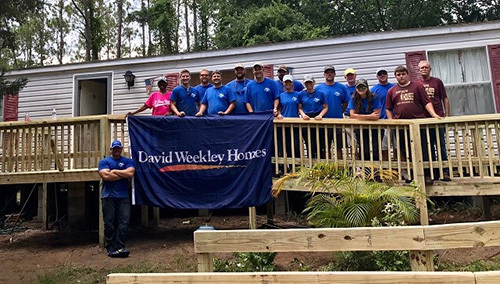 Approximately 36 Weekley team members from the company’s Jacksonville division joined together to build four ramps in two days for families with medical needs who lack the financial resources. This project benefitted four families by providing a ramp for each client, which will help them be able to leave their homes without assistance. The project included donations of $3,600 in materials and tools as well as 288 volunteer hours. The project was an initiative of the company’s CARE program, which is a charitable and volunteer program that partners team members, homeowners, homebuyers and community partners with nonprofits to make a positive impact in the lives of everyone it touches and in all the communities it builds through its purpose, Building Dreams, Enhancing Lives. This is accomplished by company team members volunteering countless hours to different organizations in their communities and by The David Weekley Family Foundation donating more than $100 million to a variety of organizations through the U.S. and abroad over the past 20 years. David Weekley Homes team members pose with a client on one of the new ramps built for St. Johns Housing Partnership.